We know a great deal about roles the environment plays in shaping survival, reproductive success, and even social systems among primates. But how do primate life histories affect social systems and vice versa? Do baboons’ patterns of growth, for example, help to structure their societies? Does fission-fusion sociality interact with predator pressure to influence the timing of maturation in chimpanzees? Exploring these issues and many others, the contributors to Primate Life Histories and Socioecology provide the first systematic attempt to understand relationships among primate life histories, ecology, and social behavior conjointly. 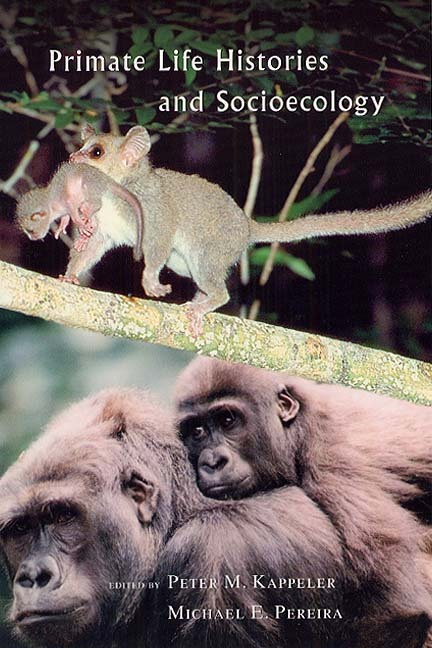 Topics covered include how primate life histories interact with rates of evolution, predator pressure, and diverse social structures; how the slow maturation of primates affects the behavior of both young and adult caregivers; and reciprocal relationships between large brains and increased social and behavioral complexity. The first collection of its kind, this book will interest a wide range of researchers, from anthropologists and evolutionary biologists to psychologists and ecologists. Paul-Michael Agapow, Susan C. Alberts, Jeanne Altmann, Robert A. Barton, Nicholas G. Blurton Jones, Robert O. Deaner, Robin I. M. Dunbar, Jörg U. Ganzhorn, Laurie R. Godfrey, Kristen Hawkes, Nick J. B. Isaac, Charles H. Janson, Kate E. Jones, William L. Jungers, Peter M. Kappeler, Susanne Klaus, Phyllis C. Lee, Steven R. Leigh, Robert D. Martin, James F. O’Connell, Sylvia Ortmann, Michael E. Pereira, Andy Purvis, Caroline Ross, Karen E. Samonds, Jutta Schmid, Stephen C. Stearns, Michael R. Sutherland, Carel P. van Schaik, and Andrea J. Webster. 12 Why Are Apes So Smart? Part Four - Where Do We Go From Here? "For the advanced reader, this volume is a rich compendium of data, methods, and ideas. The reader need not fear that this volume is just a collection of the same old correlations among the usual life history parameters." “The contributors present a broad synthesis of current research, emphasizing a variety of approaches and building a solid foundation for future investigations. This is a rich volume that is relevant not just to primatology but also to behavioral ecology, evolutionary biology, anthropology, and psychology."